The MicroMac PowerBoy Accelerator for PowerMac and Performa 6100-series models increases the speed up to 200% by employing a 120MHz to 132MHz 604 PowerPC processor and a 256KB level-2 cache. 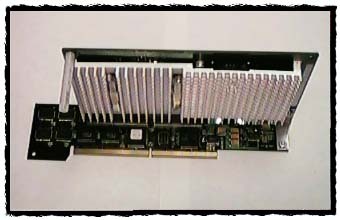 The PowerBoy is a high performance accelerator upgrade for your 6100-series Power Macintosh or Performa model. Replacing the relatively slow 601 processor with the much higher performance 604 processor running up to 132MHz the PowerBoy is ideally suited for graphic and multimedia intensive applications as well as the latest generation of Web browsers. The PowerPC Software Advantage: The PowerBoy is MicroMac's answer to upgrading your Power Macintosh 6100-series, Performa 611x Macintosh or Workgroup Server 6150 computer to the next level of PowerPC performance. Software running in native PowerPC mode is the only way to go. It delivers fast, outstanding performance as well as the latest advanced features that only a PowerPC processor can deliver. The PowerBoy keeps you on the forefront of PowerPC technology by providing the fastest processing speed available to date without compromising your budget. Upgrade your 6100 to a 604! : The PowerBoy accelerator runs at twice the frequency of your existing 6100-series Macintosh. If your 601-processor runs at 60MHz, the PowerBoy accelerator will run at 120MHz, if you presently run at 66MHz, the PowerBoy will run at 132MHz. The 604-based PowerBoy is the most cost effective solution to upgrading your 6100-series Macintosh model from a less powerful 601 processor to the more current 604 processor. With the 604 PowerBoy you'll notice a dramatic performance boost of up to 200% over the current PowerPC 601 processor's performance. That means faster system operations, quicker responses in all your favorite games and sufficient speed for Internet applications. System and Tools Requirements: PowerMac 6100/60, 6100/60AV, 6100/66, 6100/66AV, 6100/66-DOS, Performa 6110, 6112CD, 6115CD, 6116CD, 6117CD, 6118CD, WorkgroupServer 6150, 6150/66. System 7.1.2 to OS 8.1. Installation: Insert the 256KB Level-2 cache card into the cache card slot on the 6100-series logic board and plug the PowerBoy processor card into the 6100-series PDS slot. Load the accelerator init into the extensions folder. Time Requirement: About 30 minutes. MicroMac Delivers: PowerBoy accelerator board, cooling fan for existing processor, Start-up diskette, utilities diskette, and Installation Sheet.